The energy need is expected to double by 2050. Photovoltaics are among the fastest growing energy resources that produce local, clean and renewable electricity. Since roads are occupied by vehicles only 10% of the time, upgrading them to produce photovoltaic electricity prevents the misuse of farmlands and natural landscapes. The challenge is to deploy robust photovoltaic panels without reworking the floor. 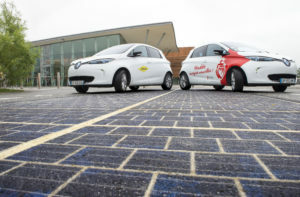 Innovation: EARTO member CEA developed the Wattway solar panels, robust enough to bear one million truck tire passes, with good adhesion and good interconnection between panels and able to be directly integrated to existing roads. The light 7mm thick composite material enables a 10-15 years lifespan, the same as any road today. 1km road paved with Wattway panels can provide the electricity to power public lighting in a city of 5.000 inhabitants. Impact Expected: Industrial-scale manufacturing is scheduled for launch by Colas in 2016 and €360 million revenues per year are expected by 2019. In France, the goal is to cover 1000km of roads with Wattway panels by 2022. Further opportunities for development include the integration of sensors providing traffic information or allowing the road to self-diagnose maintenance issues. The CEA – Atomic Energy Commission – is a French government-funded RTO and a prominent player in the European Research Area.